Tracy Law Firm attorney Todd Tracy, who is suing a Dallas-area dealership body shop for more than $1 million in a negligence case, on Wednesday sued State Farm over its alleged influence in the repair. “The day of reckoning is here—certified body shop facilities better stop listening to the insurance companies they get paid by and start listening to the OEM that spent hundreds of millions of dollars developing, designing, manufacturing and testing vehicles to provide maximum protection in foreseeable accidents,” Tracy wrote in an email Wednesday. 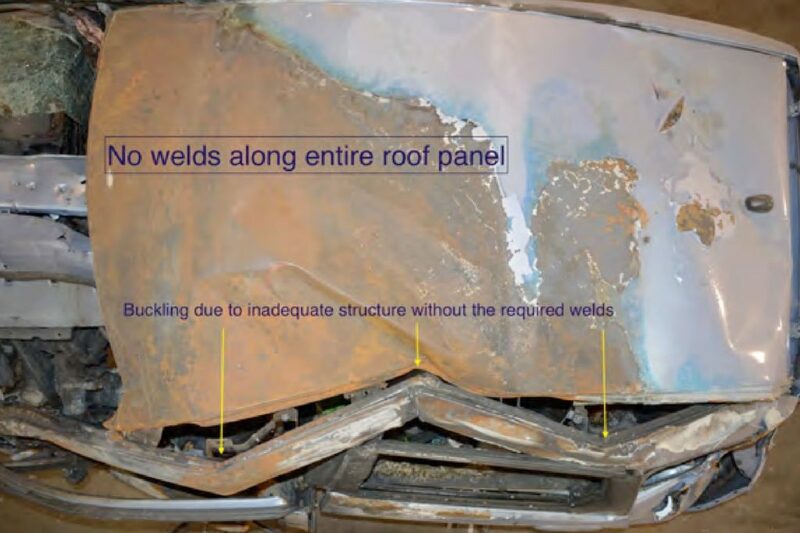 State Farm reimbursed the 2012 hail damage repair in which the body shop bonded a replacement roof to a 2010 Honda Fit rather than using the welds dictated by Honda OEM repair procedures, according to records and the deposition of John Eagle Collision Center director Boyce Willis. Shop and insurer estimates shared by Tracy’s firm do not appear to indicate a direction or suggestion by State Farm to use adhesive. However, the lawsuit in the Eastern District of Texas keys off of Willis’ deposition comments about the power an insurer can have over a collision repairer and accuses State Farm of requesting that particular repair. A. (Adhesive) is — it is a accepted repair alternative, based on our cars and insurance certifications. Q All right. And let’s have an agreement today that we don’t use the word “insurance.” Can we — is that cool? A. Well, unfortunately we’re guided by insurance.· So — the — if you brought your car into my shop, right, the insurance company’s going to dictate what — how we’re going to repair your car. Q. I understand. But the — but you — your — as a certified body shop, you have to — you — the — the insurance company cannot trump the OEM specifications, correct, sir? Q. Where does it say that? A. By not paying the bill. The lawsuit accuses State Farm of negligence; “authorizing, approving, ratifying, and/or dictating the conduct of John Eagle” in a civil conspiracy; violating the Texas Deceptive Trade Practices Act; and negligent undertaking. However, Willis in the deposition repeatedly seems to suggest that the decision in the Seebachan repair was the shop’s. “Well, our process is to adhere the structural adhesive to the panel, and then tack weld the four corners,” he said. Q. … Who approved 3M 8115 for use on Honda vehicles, specifically the 2009 to 2013 Honda Fit? Who approved it? Q. I — at the collision center. Because no one at Honda has approved the 3M 8115 product to be used. A. That would be the collision center. Q. Who at the collision center approved it? Who did that? Q. Well, had (the supervisor), had he worked at Honda Motor Company, Ltd.? Q. Had he worked at American Honda? Q. Had he worked at any vehicle manufacturer? Q. Was he a — was he — did he have a degree in mechanical engineering? Q. Did he have a degree in metallurgy? Q. Did he have a degree in structural analysis? Q. I understand that may be the case. But at the end of the day, John Eagle says that, We’re going to comply — we’re going to build your vehicle back and repair your vehicle back to the way the OEM specifies, right? A. Bonding is better than welding. A. I know that way. Q. And the OEM specs specifically state for the 2009 to 2013 Honda Fit that it’ll be welded, correct? A. That’s what Honda states. 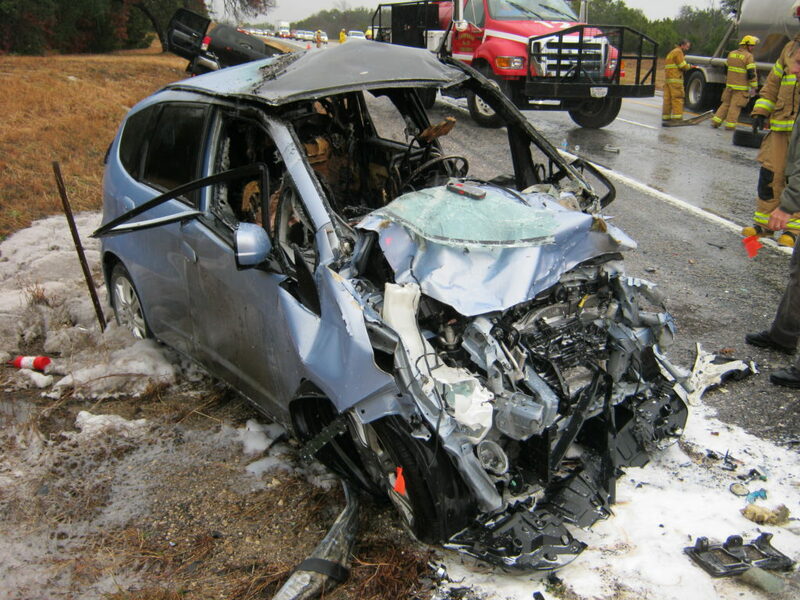 The law firm representing John Eagle Collision did not return a message seeking comment. In an answer to the initial version of the lawsuit, John Eagle Collision said some combination of the Seebachans, another party (presumably the other driver) or the accident itself were responsible for what happened. 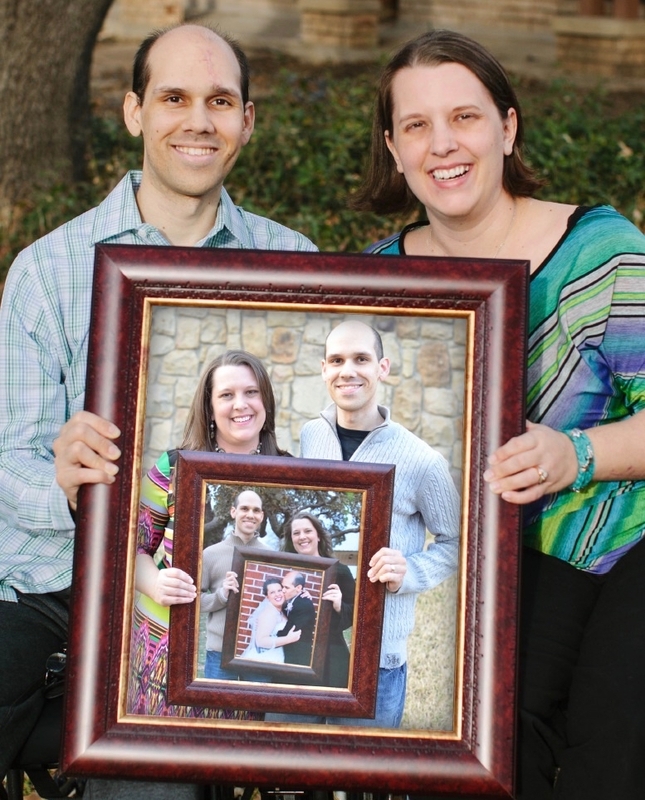 It also argued that the couple’s pre-existing and subsequent conditions and failure to mitigate their situation could be to blame for the outcome. Asked about the counterargument that a shop could say “no” if the insurer asked for an unsafe repair, Tracy said the carrier might make that difficult. (Non-DRP shops in the past have alleged insurer refusals to pay for obviously required OEM procedures such as scanning.) Shops have also alleged being labeled a problem or other retaliation from insurers if they attempt to seek payment for certain repairs. Tracy said he wasn’t sure if John Eagle Collision Center was one of State Farm’s direct repair program shops at the time of the hail repair. Such a partnership — in which an insurer offers policyholder referral volume in exchange for shop concessions — could potentially give an insurer greater influence over a repairer. John Eagle Collision is not listed on State Farm’s Select Service locator, and the body shop’s website on Wednesday only describes direct repair program relationships with USAA and Farmers (and “AAA Auto Repair Certified” status). The connection the plaintiffs are alleging in this case so far seems somewhat tenuous given some of Willis’ comments. But shops and insurers should still pay attention to the general arguments made within Seebachans v. State Farm regarding insurer intrusion into the repair process. Those accusations might be more applicable to other insurer-paid collision repair claims, and they set up a whole new dimension of potential litigation related to shops violating OEM repair procedures. Vehicle manufacturers sell safety. Vehicle manufacturers spend hundreds of millions of dollars each year developing, designing, engineering, manufacturing, and testing their vehicles so that they will be crashworthy in the event of foreseeable accidents. Collision Repair Centers sell expertise in how to safely repair cars. In fact, these certified facilities tout how they follow OEM specifications and will restore your vehicle to better than it was before the accident. Vehicle insurance companies like State Farm sell insurance. They are not in the business of designing vehicles, or testing vehicles, or repairing vehicles. No insurance company should ever dictate to a collision repair center or body shop how to repair a vehicle. To do so is extremely negligent, and shows a wanton disregard for human life and the safety of others. Collision repair centers/body shops should always follow the vehicle manufacturer’s procedures/OEM repair specifications and should never be coerced or enticed by an insurance company to cut corners, take safety shortcuts, or do anything that jeopardizes members of the motoring public. All that said, the collision repair industry shouldn’t expect trial lawyers to skip them and solely focus on the insurers. It seems like proving that a shop violated OEM repair procedures would be far easier than proving an insurer unduly coerced the shop to do so with a metaphorical gun to the head. After all, Tracy and the Seebachans haven’t dropped the case against John Eagle Collision just because they’re also suing State Farm. Trial for the body shop begins in September.